Twitter Could Be Your Key to Winning Great Prizes. Find Out How. Twitter sweepstakes are a quick and inexpensive way for companies to gain followers, followers who may then be receptive to buying their products. As a result, Twitter sweepstakes have become very popular, and many people who are not winning as many prizes through online sweepstakes as they did a few years ago are winning even more often with Twitter. And that's not the only reason why sweepstakes fans should pay attention to Twitter. Many online sweepstakes that give you extra entries for posting about their giveaway on Twitter or for encouraging your followers to enter the sweepstakes by posting your unique entry link on the social media platform. If you'd like to get in on winning those prizes yourself, here is a guide to winning Twitter sweepstakes from the basics of starting your free Twitter account to winning advice for more advanced Twitter users. Twitter is a micro-blogging platform where people chat about everything from what they ate for breakfast, to tips on succeeding in business, to breaking news, and even chances to win with Twitter contests. The difference between Twitter and other blogging platforms and social media sites is that Twitter updates come in bite-sized chunks of 140 characters or less. 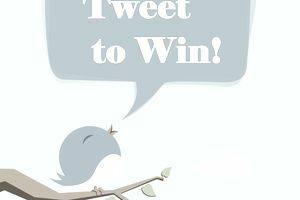 To take advantage of most Twitter contests, you'll need to have a Twitter account. Luckily, accounts are free and easy to start. Just visit Twitter.com and follow the directions to open your account. Once your account is set up, you can get started by making your first tweet, or you can click on the "Find People" link to start following others. If you want to use Twitter to win prizes, you can search for the #sweepstakes hashtag to find other people who like to enter giveaways and companies whose sweepstakes you're interested in entering. Feeling Confused by Twitter Jargon? If terms like tweeting, retweeting, and tweeple have you confused, don't worry, Twitter users have their own jargon, and that jargon is often used in sweepstakes rules or posts about entering on Twitter. It's helpful to know the Top Twitter Terms for Beginners before you start entering sweepstakes to be sure you understand all of the terms you'll need. Follow the person or company holding the Twitter contest. Retweet a post the person or company has made. Make a Tweet that includes a specific hashtag. Be the first to @reply to the contest sponsor with a trivia answer. Join a Twitter Party and participate in a conversation through Tweets to win prizes. Read the rules of each Twitter contest carefully to see what you have to do to enter. Some have multiple steps you need to take before your entry is valid. Sometimes, you'll need to click on a link in a Tweet to get to the full rules. Follow Sandra Grauschopf's account, @ContestsGuide, on Twitter for updates about online sweepstakes and Twitter contests. Use the TweetDeck Twitter Client to set up permanent searches, so that you can see sweepstakes new and information scroll by. Search on Google to find Twitter contests and the sites that list them. If you find companies whose sweepstakes you like to enter on Twitter, follow their accounts to find out when a new contest begins. The disadvantage of Twitter contests is that they have little oversight. Anyone can make a free Twitter account and announce that they are holding a contest, and unlike online sweepstakes, they don't even need to build a reputable-looking website to do it. While the majority of Twitter contests are on the up-and-up, it's wise to keep an eye out for scams. Before entering, look at the Twitter account of the person or company who's holding the contest. Have they made a significant number of posts over a reasonable period of time? Do their tweets seem professionally written? Do they make substantial tweets about topics other than giveaways? Are the posts on-topic for the company behind the sweepstakes? Do They Have a Reasonable Number of Followers? Any major company will have a significant number of followers. Twitter contests from accounts with only a few followers (especially if they are following lots of people themselves) are cause for suspicion. Is This an Official Twitter Account? If the sweepstakes is hosted by a big brand, check out their website for their official Twitter address. Does it match the one that is holding the giveaway? Does the account have a blue badge indicating it has been verified by Twitter? Fake Tweets are easy to recognize once you learn the warning signs. Don't respond to fake Tweets, and certainly don't click on any links or give any personal information in response to them! Search on Twitter to see if anyone has made complaints against that account from people who entered a fraudulent Twitter contest. The cardinal rule of sweepstakes is that you don't pay to win, and that holds true for Twitter contests as well. If they ask for money, a bank account number, or a credit card, steer clear. If you have doubts about whether a Twitter contest is legit, stay away. It's better to miss a chance to win than to be scammed. Why Do URLs on Twitter Look So Strange? If you look through Twitter posts, you'll see that a lot of links look something like this: http://bit.ly/ijLHe Links that start with bit.ly or tinyurl have been shortened to save precious space in that 140-character limit that Twitter imposes. It can be difficult to know where a shortened URL is taking you, so make sure you aren't responding to a scam before clicking. Want to know whether it's worthwhile to enter Twitter giveaways? Read my Twitter Review for Sweepstakes Fans.